Blinds cover lots of different openings. What do we do when you need Sliding Door Blinds? There are still lots of options available, so don’t fret! It doesn’t matter what you call it. If it opens, it’s a door! Doors are generally larger than windows and need to be readily accessed. This means that whatever blind you choose, you need the convenience of easy access to it. Vertical Blinds: These slide easily to one or either side with slats of 90mm or 127mm widths. Venetian Blinds: Slatted blinds of Wood, Fauxwood, or Aluminium which can be tilted or raised. 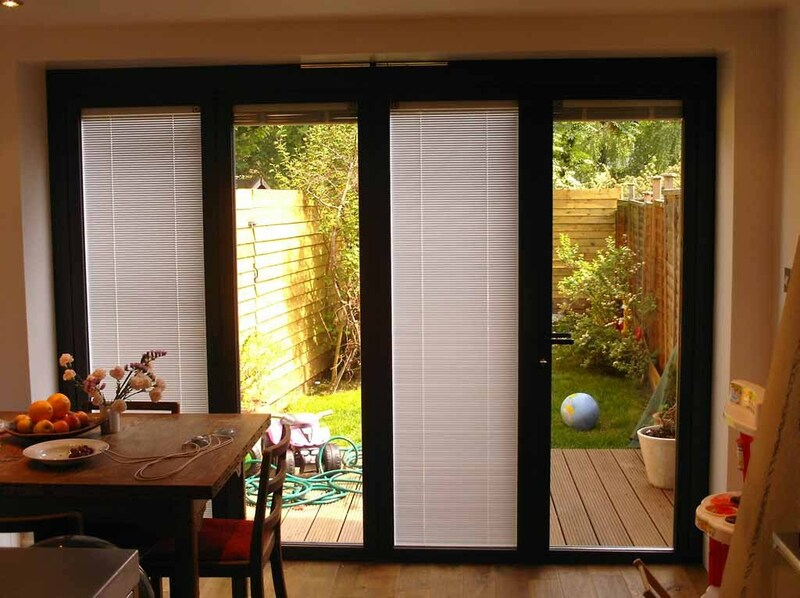 Panel Blinds: Large panels that slide to one or either side. The panels are custom sized for your window. 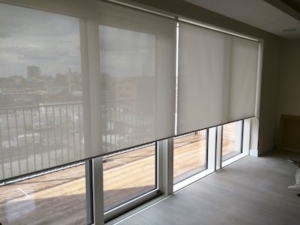 Roller Blinds: A large piece of material that can be raised and lowered from a roll at the top. Roman Blinds: Material blinds that are folded up in panels. Honeycomb/Pleated Blinds: Material that folds up and down, compressing when they’re opened. Shutters: PVC, wood, or aluminium louvre blinds. Shutters can stack, hinge, or slide. For a space in which blinds need to be often moved out of the way, we do not recommend Venetian Blinds. They tend to be heavy and cumbersome to raise in order to access the door. We always recommend that Venetian Blinds remain in the lowered position. The slats can then be tilted open, closed, or directing sun away from you. Roman Blinds tend to be less durable on large spaces. Big windows make them more bulky than a roller or sliding blind. They are a viable option in some cases so be sure to ask your sales assistant! Without a doubt, a Roller Blind, Panel Blind, Vertical Blind, Honeycomb Blind, or Shutter are all great options as sliding door blinds. Many customers choose a Roller blind do to it’s beauty and functionality. A roller blind doesn’t take up any room space when rolled up. It’s easy to manoeuvre, durable, and available in a large range of colors and fabrics. Panel Blinds are also common options. The panels stack up, one behind the other, to the side or both sides. Some customers don’t like the fact that there’s always some room taken up by the panels. For a stacking door that opens up an entire wall space, this might not be the best option for you. They’re available in tons of materials from sheerweave, to light filtering, to blockout. Colors and patterns are almost limitless as well. Vertical Blinds, while not the most popular choice, are practical for a large window opening like a sliding door. They easily move to the side and take up very little space when stacked. Some customers find the chain at the bottom to be cumbersome. As they are available in a range of colors and fabrics, there’s surely a color and material for you. Honeycomb/Pleated blinds are light and easy to manoeuvre. These blinds can be easily raised to the desired height and are available in light filtering as well as blockout options. Shutters are a great option if you have the space for them to stack. If not, a sliding shutter might be just what you need. As most shutters stack concertina, one needs ample space in front of the window to allow the shutters the space they require to open and close. 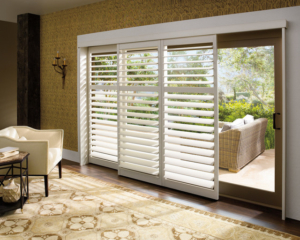 Assuming you have this space, then shutters are an elegant option. Sliding Door Blinds – Stick It Where?!? Once the customer has narrowed down the type of blind most suitable, the next question is placement. Do we put the blind in the window reveal, or above? “In the reveal” refers to blinds that fit neatly within the confines of the window-frame. Face-Fix refers to a blind that is affixed above the window, onto the wall. Should there be space in the reveal, it’s not always practical for a sliding door. Because some doors are lower than others, many customers feel strongly to ensure there’s more than enough space for tall visitors to walk through the opening. Blinds do take up some space, especially Venetian Blinds. Additionally, there isn’t always the space required to affix the blinds this way. One factor in determining placement of the blind, is whether or not the doors stack inwards or outwards. If they do, then the blinds with interfere with the door’s movements and Face Fix must be utilised. Now we’ve decided on the type of blind as well as the color. Most sliding doors necessitate splitting of blinds. For large spaces (it differs depending on the blind type you choose), the opening will probably require multiple blinds. Some customers prefer an even split amongst the window. Others choose to only split where the window frame is located. Others choose to make one smaller blind on the opening side of the door so one can enter and exit freely without lifting up heavy blinds. This is something that our friendly sales staff will discuss with you on site. One of the final steps in ordering sliding door blinds is which side the chains/cords are located. Generally, on a sliding door split into two blinds we place the left blind’s chain on the left, and the right’s on the right. There might be complicating factors affecting this decision. But don’t worry, we will discuss with you the ins and outs of either choice and will guide you towards what will ultimately be the most convenient and aesthetically pleasing for our customer. The Decor Connection Blinds is here to help you make an informed decision about sliding door blinds.